"Electricity generation is currently the largest source of energy-related CO2 emissions in the United States ." 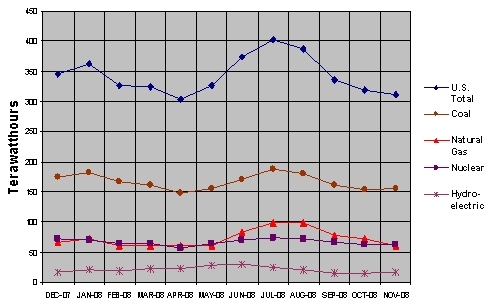 Electricity usage is measured in Kilowatt-Hours (kWh), which add up over time. One kilowatt-hour equals 1,000 watt-hours. For example, if you burn a 100-watt light bulb for one hour, you've used 100 watt-hours of energy. If you burn that same 100-watt bulb for 10 hours, you've used 1,000 watt-hours - or 1 kilowatt-hour (kWh) - of energy. You could also run your 700-watt plasma TV for 3 hours and use another 2.1 kWh of energy. It all adds up over time. Let's say you use the average of 10,000 kWh per month. If your electricity comes from coal, that means you are personally responsible for putting about 200,000 pounds of CO2 in the atmosphere every month! If your electricity comes solely from hydropower, your CO2 emission would be zero. "Fossil-fuel power plants generate electricity by first heating water to convert it to high pressure steam." By itself, electricity is an exceptionally clean form of energy – but we have to consider how it is generated. Today, about 70% of U.S. electricity is produced from fossil fuels (about 50% from coal, and 20% from natural gas). Nuclear power accounts for another 20%, leaving about 10% coming from renewable resources like wind, water and solar. The result of this mix is that electricity generation is currently the largest source of energy-related CO2 emissions in the United States. With the exception of hydropower, wind and photovoltaic solar energy, most power plants generate electricity by burning fuel. For example, large diesel generators operate similarly to portable home generators, where a conventional, fuel-burning engine is connected directly to a generator to produce electricity. Natural gas is similar, although it is burned in something more like a jet engine, but still connected directly to a generator. Coal, our most common fuel source for electricity, is used differently. Since coal doesn't run an engine very well, a coal-fired plant burns its fuel in a special boiler that heats water-filled pipes, and the resulting high-pressure steam is used to drive a turbine that is connected to a generator. Nuclear power plants work similarly, although the "fuel" used to produce steam is radioactive material and the heat is generated through nuclear fission (splitting atoms). The process of using heat to create steam power has been around for hundreds of years, and works with just about any fuel source - even wood. You may be surprised to learn, therefore, that steam power is being revived for a new generation of high-tech solar power plants. Concentrating Solar Panels (CSPs) use reflective surfaces to collect and concentrate the sun's rays onto a very small area, creating tremendous heat to drive steam turbines. But this time, the fuel has no emissions, no waste, and no ongoing costs. Diagram of the operation of a typical coal-fired power plant. Coal is burned in a boiler, heating water to create high-pressure steam which drives a turbine. A steam turbine operates much like a water-driven hydropower turbine, but needs a heat source to create the steam. Nuclear power plants operate similarly, producing intense heat to drive steam-driven turbines. 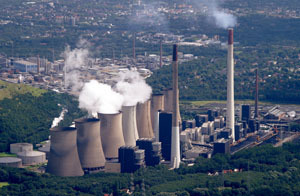 Scholven Power Station, located in Germany, is one of the largest coal-fired power plants in Europe. Producing up to 2,300 megawatts, the plant provides about 3% of Germany's electricity needs.